Through our offices in the Pacific Rim, SimmonsGroupLtd.com provides a wide range of castings to clients throughout the world. Hot chamber machines of up to 250 tons are available for zinc die castings. Cold chamber equipment of 250 tons and up to 1,600 tons is available for brass and aluminum castings. 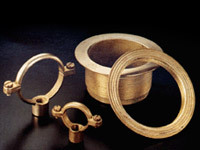 For those critical brass and aluminum die castings which require a higher quality finish and greater strength, gravity-fed die casting is also available, as are powder-coated aluminum die castings. Machining capability, from simple drilling operations to the most complex drilling operations, utilizing the latest in Computer Numerical Control (CNC) machining centers, exist for finished parts. Surface finishes from polished brass with lacquer coating to satin or polished chrome, epoxy liquid or powder-coated product offering an array of color choices.